Think back to when you *first* started building your brand. But you figured it out! Over time – through trial and error, freedom and frustration, and richer and poorer – you reigned in your branding. You blazed your own trail and built a successful, profitable, and cohesive business! But every time you climb, the ceiling gets a little higher. There’s still room to grow – to reach larger audiences, double or triple your income, release new products or services, etc. And you’re ready to get your scale on. In order to move your business forward successfully, you’ll need to be strategic. Question: Now that you’ve gotten to know your brand, do you still spend time really considering what “on brand” means? I ask because, just like your potential, the definition of on brand grows with time. Is this a smart decision? 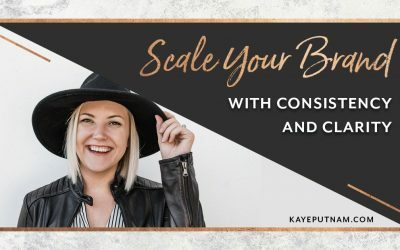 Between growing my own business and working with hundreds of entrepreneurs over the years, I’ve learned a thing or two about how to scale strategically (and alternatively, how NOT to scale). When you were a newbie, you had to pitch yourself for even the most basic interviews or podcasts. But these days, you’re getting more requests than ever! Instead of hustling to find customers or clients, you’re upping your game to keep them interested. You may even be ready to hire a PR person to establish your street cred with the major news outlets. Just remember – getting your name out there does NOT mean taking every opportunity that comes your way. Focus on the relevant ones. Those are the ones that will have the greatest impact. Will the intended audience offer new exposure? Will it appeal to the majority of my audience? Do I believe in their business model? Do they share my values or beliefs? Does the partnership complement my products or services? Do I trust their services enough to refer my clients to them? If the answer to these questions is NO, then you’re probably wasting your time. The best partnerships will have you saying YES across the board! It’s tempting to follow the fads and trends you see popping up in your market or on social media. After all, your brand should be part of the conversation, right?! There are so many trends emerging daily, but you need to make sure that every decision you make for your brand – whether it’s the topic of a blog post or an element of design – is on brand. For example, you may be thinking, “Everyone is using Instagram now. I must need one, too!” But, do you? Is that where your audience is hanging out? Is Instagram an effective platform for promoting the kind of content that you share? It’s important to remember that there are very specific tactics that work for each platform, and it’s better to have a strong presence in a few places than to be spread too thin everywhere. Here’s another example: You’re a service-based entrepreneur (like a copywriter or designer) and you’ve noticed that LOTS of others in your space are offering coaching as a service. Before you decide to add another service offering, take the time to consider if it’s right for you, your brand, and your audience. Does it stray too far from your core idea and services? Does it genuinely excite you? Quick money doesn’t mean a long-term profit if you’re doing work you’re not passionate about. It isn’t enough to be trendy – and chasing too many trends can actually be a detriment to your brand. Before you commit to following through with a new trend, be sure that it aligns with your brand messaging and archetypal guidelines. Any brand can say that X tactic is working for them, but without the foundational work to align X tactic to their specific brand, it’s a fruitless exercise. As your business progresses, you’re most likely finding better, faster, and more efficient ways to operate. You may have outgrown systems you once used, content you once shared, or designs you once connected to… so it’s crucial to keep up with these changes! Last time I updated my website, at least ten blogs were scrapped. Do I like throwing out content? Of course not! But, it was simply no longer a reflection of my brand, and to maintain a strong identity, it had to go. 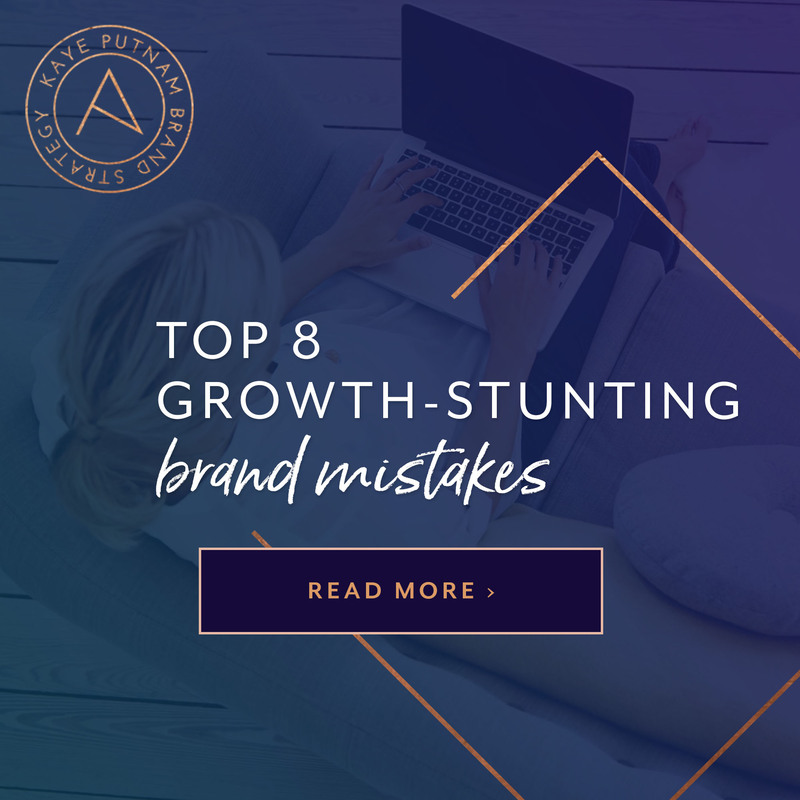 Maybe when you were starting your business, you spent hours pouring over fonts to find the perfect style for your logo… and maybe it even served you well for quite a while! But, as your brand matures, your design should be a reflection of where you’re at. If your logo no longer works and it’s time for a professional to step in and give your brand a more upscale and professional look, don’t be afraid to say goodbye to outgrown assets. When you’re scaling your business, it’s especially important to update your standard operating procedures. Even if you don’t have them officially written up, you probably have processes in place throughout your business. Maybe you’ve been manually sending out invoices and following up, but it’s time to invest in billing software, like Harvest or AND.CO. Maybe you’ve been using MailChimp for years, but there’s a more robust automation software out there that’ll get you further. Whatever it is; don’t be afraid to change your processes for the better. Your clients and customers will have a better experience for it! You’ve got steady contracts coming in and can finally afford to expand your team. What an exciting time! 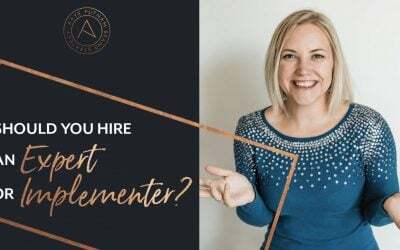 There are so many different avenues to hire help within your business – copywriters, virtual assistants, designers, social media experts, SEO gurus, business coaches, and more. So where do you spend your money? I cannot stress this enough: Make a plan. It’s easy to get hire-happy when you have certain offerings or deliverables in mind, but it takes strategy to avoid unnecessary spending and make your hiring worth it in the long haul. What tasks take up most of my time? What’s the MOST important thing to get off of my plate right now? 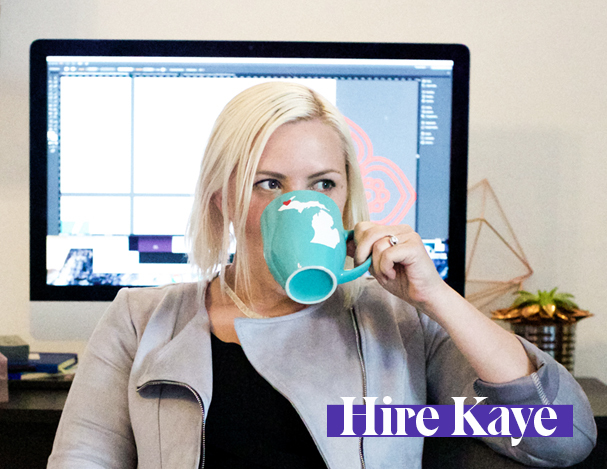 If I hire _____, what’s the ROI? What’s the opportunity cost of hiring, say, a designer over a copywriter? How will the new hire help me afford to hire someone else in the next 3-6 months? By asking these questions, you’re taking the necessary caution to grow strategically and in a way that promotes further growth. In the quest to run our most lucrative, successful business, it’s far too easy to present a more corporate image than your brand may actually identify with. Just remember: you can be professional AND personable, and your audience will ADORE you for it! Don’t lose your stories! Some may buy into the idea that brands can be too personal and opt for cookie-cutter messaging in an attempt to attract the most new customers or clients. But what most of these companies fail to understand is that if they were true to their core personality and offered transparency around their success and failures along the way, they’d attract a much more engaged customer base because they’d be forming emotional connections. Another easy way to stay true to yourself is to practice what you preach. For example, if you’ve always HATED cold calls, call that out in your values and find other ways to build awareness. If you’re not a fan of the ultra-professional business attire look for team photos, plan a more personable photoshoot outside of the office. Whatever you do, stay true to your own values and inclinations. This is a key pain point for many of my one-on-one intensive client projects, and usually falls into one of two questions: How do you brand out to a new target market? + How do you add a service that’s radically different from what you’ve previously offered? Is it worth creating a branch of your business that targets a totally new audience? If so, how do I need to change my language/messaging to reflect this new target? Would it be better to build a completely new brand for my new idea? Can the new services or offerings complement what I’ve already built? For example, Coors once tried to market a sparkling water. The product packaging was very similar to their branding for beer, which probably should have been their first red flag that it would fail. Their “rocky mountain cold” slogan and beer-lover branding didn’t fit their new product and didn’t effectively sell to their new target market. Preparing for the long-term can be a giant PITA (and I’m not talking about bread for gyros here). That being said – it’s totally necessary. In order to remain strong as you scale, you need to decide where you want to be in 6 months. But, more importantly, where you’d like to be 1 year, 5 years, and 10 years from now. 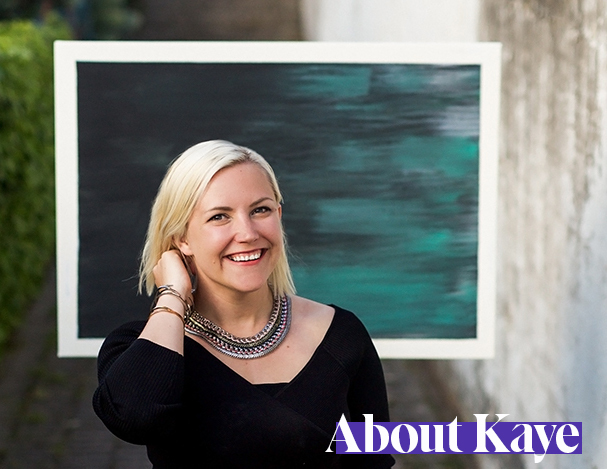 How are the decisions I make in my business affecting my brand down the road? If I hire this person, will I still need their help in 5 years? Or should I stick with a contractor, since I’ll only need short-term help for 6 months? If I make X number of dollars, how much should be going towards ad cost, ownership cut, employee payroll, overhead, etc.? 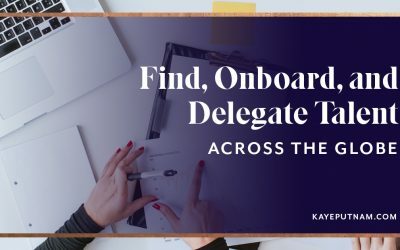 How much do I need to sell next year to ensure that I meet my goals? How much do I need to scale to be where I want to be in 5 years? How can I setup my products and services for future success? All of these questions (and so many others) will help you keep the big picture in mind as you’re navigating individual decisions for your business. The truth is, you *NEED* to understand what’s on or off brand for your business, or else you’ll never be able to scale appropriately. Just think of it this way: if you don’t know what’s on brand, how can any of your employees create effective products, copy, or designs on your behalf? The absolute last thing you want to do as you’re growing is micromanage every aspect of your business. You hired people to be a help; not a hindrance, so it’s imperative that you can trust in their work. Every single decision you make in your brand is easier when you have your standards outlined and written to hold you accountable. You’re the one making the final decisions, so it’s crucial to always ask yourself if you’re being consistent with your message and values. 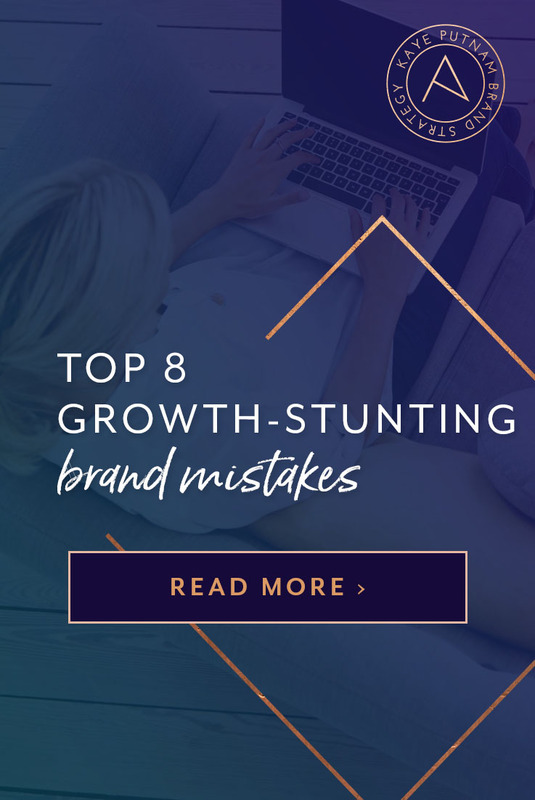 Lucky for you, helping entrepreneurs avoid branding mistakes is my specialty. If you need help reigning in your brand standards so that you can move forward (without taking steps back), check out the Clarity Code. 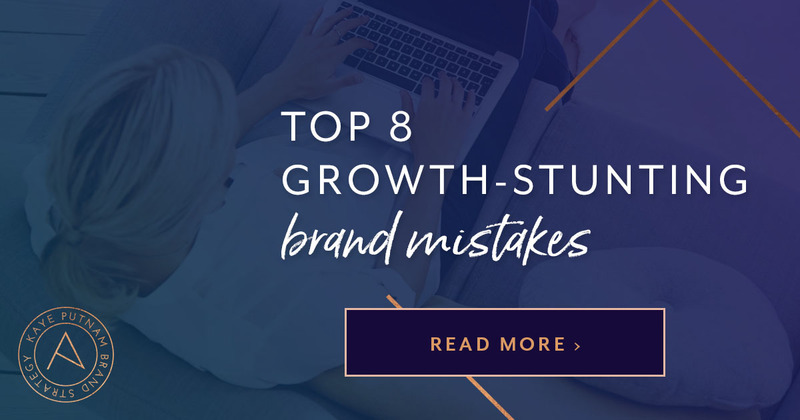 With my help, you’ll get to know your brand inside and out, so every choice you make will be rooted in understanding and propel your brand’s growth. Ive hired too quickly in the past. Wish I read your tips especially on the ROI of a new hire.. would’ve saved me lots in the long run.